Barry Verragio established the brand in 1996 after the completion of his studies at the Fashion Institute of Technology. Since its founding, Verragio has skyrocketed into a reputable bridal jewelry designer around the globe. Barry Verragio creates eye-catching bridal jewelry of different styles and collections, and his pieces are renowned for the level of customization offered. His products are diversified in such a manner as to suit the desires of both men and women. Verragio's design styles involve customizing the rings in rose gold, yellow gold, white gold, and platinum as well. Barry Verragio incorporates varying styles in his collections. The collections of Verragio wedding bands for women include the Couture, Classic, Paradiso, Insignia and Parisian. For instance, the Couture collection focuses on utilizing a clean cut design to establish its unique style. On the other hand, the Classic collection is made up of simple wedding band styles. Classic rings embrace timeless ring silhouettes tied together with decorative style elements. The Venetian lacework targets the side profiles of the wedding bands. Often, the Venetian collection contains the French beading to boost its style. Long Jewelers provides pieces from the Parisian and Insignia collections as well. The Insignia rings contain created rings with swirls and ornate scrolls. The rings from this collection use curves to give off elegant, feminine appearances. Additionally, the brand also offers a wedding band collection for men. 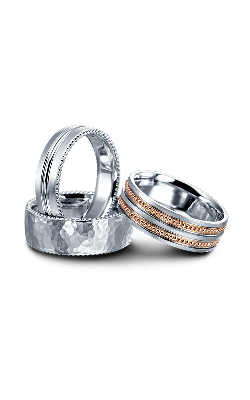 These pieces are original in look and are perfect for men who want to make a fashion statement with their wedding band. Long Jewelers is situated in Virginia Beach, Virginia and we serve the Norfolk, Chesapeake, and Tidewater communities as well. For over three decades, we have dedicated our work to providing our clients with the best fine and bridal jewelry, timepieces, and loose diamonds in the area. Additionally, our showroom has been featured in magazines like InStyle and Town & Country, and we are proud to have been voted “Best of the Beach” for over 20 years. So when you visit us, you can relax knowing that you are in very capable hands. If you are interested in any of our products or services, call (757)-498-1186 for further details.